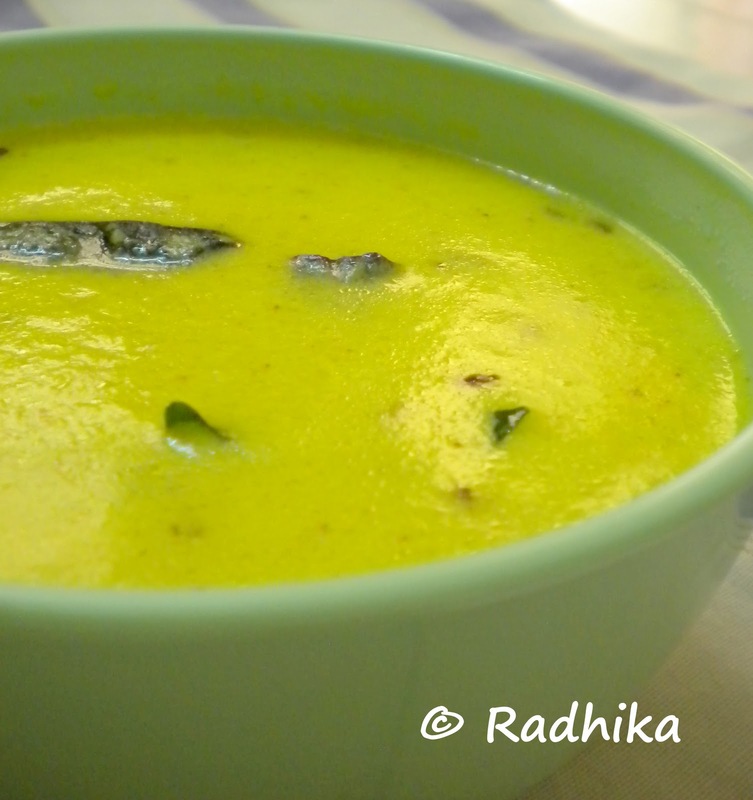 This Kulambu happens to be Arun’s favorite and he demands that I make it every Sunday so that he can have it with hot rice for lunch in the plate rather than in the lunch box what with the rice getting cold during the lunch time. The easiest and less time consuming kulambu that could be made in a jiffy which also happens to be my comfort food. Wash and soak rice and toor dal for 30 mins. Then grind it to a smooth paste along with grated coconut, green chillies, ginger and cumin seeds. 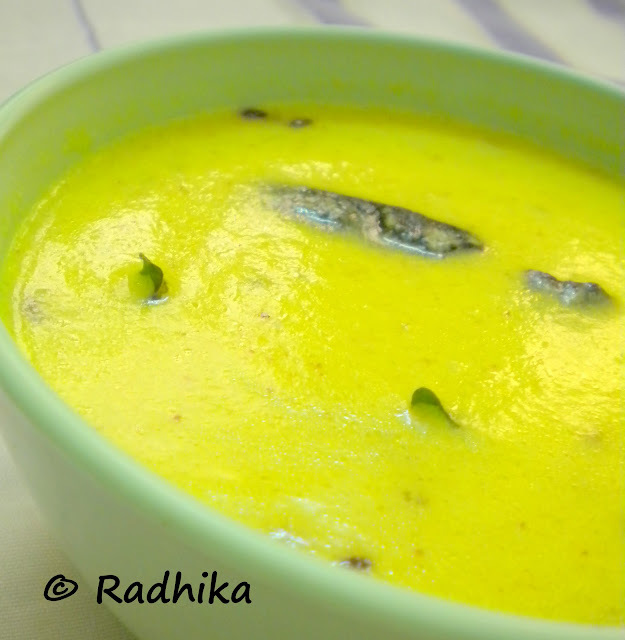 In a bowl, mix together the curd, ground paste, turmeric powder, salt and required amount of water depending on the gravy and thickness you want. Heat the coconut oil in a kadai and add the mustard seeds. Once it pops add cumin seeds, whole chillies, curry leaves and add the mixed curd gravy to this tempering. Keep the flame in the medium and bring the liquid to a boil and simmer for a few seconds. Once it starts boiling and rising to the top like milk does switch off the stove and transfer to the serving bowl. Garnish with coriander leaves. Note: I have used coconut oil as it adds a lot of flavor to the gravy. You can use any cooking oil. Hmm that looks very interesting and delicious! this looks soo fresh and tasty ! 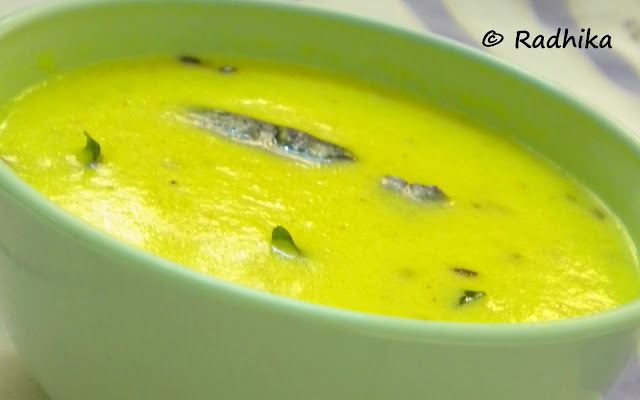 Even i prepare the similar way..def its a quick fix kuzhambu..
My all time favorite! Looks mouthwatering! Lovely color’ love mor kuzhambu so much, refreshing. My favorite kuzhambu after vegayam-murungakkai sambar!